The 3.1.3 firmware update for the iPhone is out now, available through an iTunes update. 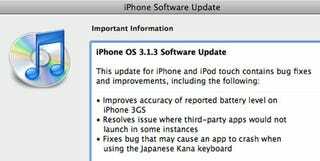 It's no revelation, fixing only the accuracy of the 3GS battery meter and the stability of some third-party app launches. Apologies if you were excited. Also, word has it that this update will nullify your jailbreak. And so far, it doesn't appear that there's anything in 3.1.3 worth abandoning your freedom for.